What Is The Estimated Extensor Tendonitis Recovery Time? 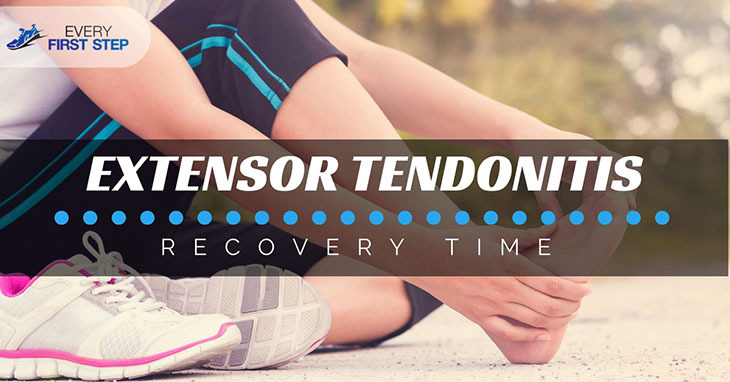 →What Is The Estimated Extensor Tendonitis Recovery Time? Extensor Tendonitis may sound like a severe and dangerous disease, but it isn't. In simple terms, the condition is caused by overuse of the tendons, bones, and muscles in either the feet or hands. As a runner, it is likely that your condition is caused by either wearing tight shoes or standing on your feet for long periods of time. The good news is Extensor Tendonitis recovery time can be greatly shortened if you follow the right procedure. In this article, we will discuss what you can do to hasten recovery time and how to prevent future problems. Since these muscles play an important role in the movement of your foot, standing on them while they are inflamed will slow down your recovery greatly. Strengthening exercises help rebuild the strength of the extensor muscles which improves strength and endurance. However that these stretches should only be initiated when there is no more swelling in the area. Usually, this would be a few days after injury. Follow the right technique to maintain flexibility. Be aware of repetitive action which can only make matters worse. Make sure to take a day rest in between your workout sessions to allow the muscles to recover. Lastly, refrain from working out in cold weather which causes stiff tendons. The type of food you should include in your diet to increase recovery is fiber to help in absorbing more nutrients. Not only will these foods help in your extensor tendonitis recovery but are also valuable in speeding up the recovery time after more serious injuries such as ACL surgery. Processed Meat - This kind of food include red meat, refined carbs, fried foods, and sodas. These foods have saturated fats and cause high cholesterol and high blood sugar levels all of which are related to inflammation. Trans Fats - In addition, anything with trans fats such as creamers, margarine that increase LDL cholesterol levels should be avoided. Once you experience extensor tendonitis, your tendons will become more prone to injury in the future so keep this in mind. If you follow the tips above and are successful in avoiding stress on the affected area, do appropriate stretches after a few days and maintain a good diet, recovery will be fast. Some people are able to gain enough strength to return to their running within a few weeks while others may take longer. How did you like this article? Have you experienced extensor tendonitis? How long did it take for you to return to running? What additional tips would you like to share? We’d love to hear your thoughts in the comments below. Also please share this article with others.